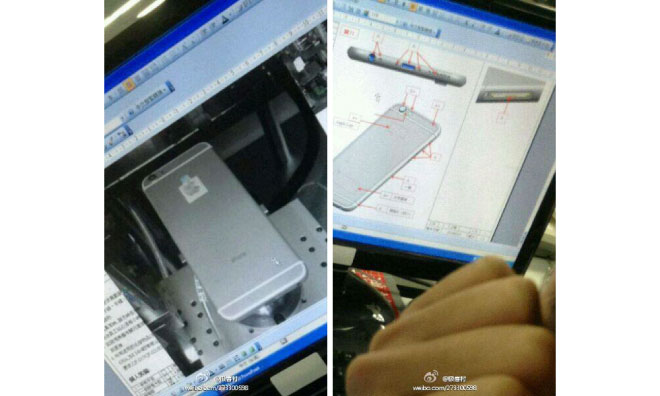 New snapshots that purport to show a prototype of Apple's so-called "iPhone 6" have emerged from China, though the device pictured bears some bizarre inconsistencies that call its authenticity into question. The photos depict a handset slightly taller, wider, and thinner than the iPhone 5s and are said to have come directly from insiders at Taiwanese contract manufacturer Foxconn, Apple's longtime iPhone assembly partner. They were originally published on Chinese microblogging site Weibo and first noticed by GforGames. The two most prominent changes from current models are an iPod touch-style protruding camera lens and the lack of the dual-LED True Tone flash setup found in the iPhone 5s. While the external camera lens may be a trade-off for overall device size, it seems unlikely that Apple would abandon the True Tone system as imaging becomes a more important differentiator in mobile devices. It is difficult to ascertain the exact size due to the photos' low resolution, though the spacing between the headphone jack and the Lightning port suggests it may play host to a screen somewhat less than five inches diagonally. Schematics included in the images also show iPhone 5c-style speaker holes. There are some areas where the pictured device does line up with rumors about Apple's next-generation iPhone. That handset is believed to sport a larger display, for instance, and an industrial design reminiscent of the iPad mini.